The Home Ground anti-war album project sparks Retro Activism this week thanks to the efforts of Dutch composer, arranger and musician Stephen Emmer with the album release. In a world constantly in conflict over land, religion and race, the Home Ground Project aims to raise the global consciousness by resurrecting a lost musical genre of classic soul music, orchestral composition and a socially conscious lyrical style rooted in the past a la Stevie Wonder, Marvin Gaye, Isaac Hayes, Bill Withers and Curtis Mayfield. Emmer is well known for creating contemporary albums that focus on a genre of music brought to life with celebrated vocal styles (International Blue 2014). In Home Ground, he brings together the soulful vocals of icons Chaka Khan, Patti Austin, Leon Ware and a host of other noted soul singers. The main theme of Home Ground addresses contemporary concerns — a world in constant conflict. “It’s not only black against white, it’s poor against rich, it’s fair against unfair.” In Home Ground, Emmer has created an album that emphasizes the drama and sophistication prominent in the soul music of the past in a pure retro, nostalgic way — merging the emotional messages of then, with the sonic impact of today. The international album project begs the question: is What’s Going On (Marvin Gaye) still the number one phrase in the turbulent times we live in today? 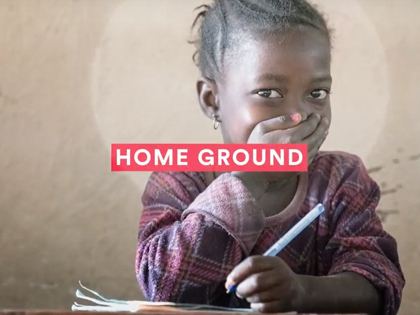 The Home Ground campaign will help raise awareness for the charity War Child, an organization committed to protecting and supporting children affected by armed conflict. According to Emmer, War Child is the perfect fit. The charity uses both music and creativity as an important tool in their program for children to overcome fear, depression and aggression. A portion of proceeds from the album and project will benefit the organization to help children from conflict-affected areas. The musical backdrop for the new album was inspired by music arrangers such as; Charles Stepney, David Van de Pitte, Dale Warren, Gene Page and Johnny Allen — all of whom were adventurous in their almost cinematic use of the orchestra for soul music — which gave it more sophistication and refinement. The composers and artists of that era often decided to embed the harsh meaning of their words in a less aggressive, more soothing kind of musicality, rather than sending off angry lyrics with angry music. Emmer hopes to continue the musical vision of the composers and arrangers of yore by putting an array of carefully selected stunning soul singers over the last 5 decades. The roster of vocal talent performing on the new album includes icons Chaka Khan, Leon Ware, Patti Austin, Kendra Foster, Andy Bey, Mary Griffin, Frank McComb, Dwight Trible and Ursula Rucker. Music composed and produced by Stephen Emmer. Lyrics written by Emmer, Glen Gregory, Ursula Rucker and Chaka Khan. If you happen to be in New York City tomorrow, June 15th, the official album release party begins at 9:00pm at the Bowery Electric with a Special Performance by Ursula Rucker, hosted by Stephen Emmer. This is a free event and part of the venue’s Mobile Mondays series. Retro Activism is alive and well with Emmer and Home Ground – reaching higher ground. — Abbe is Socially Sparked!